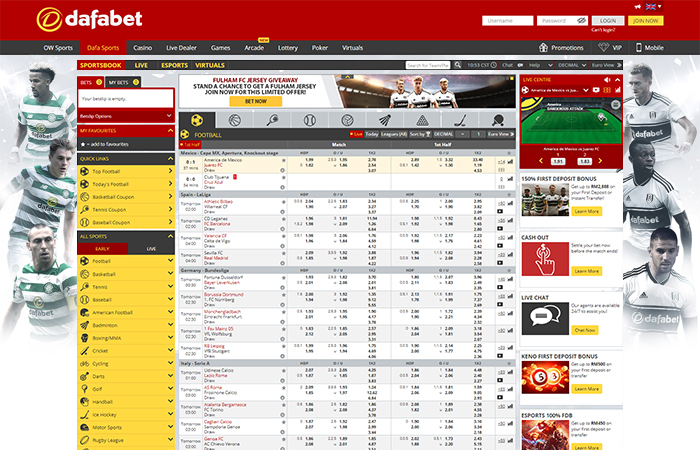 AsianBGE has launched Dafa Sports, a new sportsbook from Asia’s most reliable betting site. Dafa Sports has great functionality, with its simple design and easy navigation that make your sports betting experience a delightful one. This new sportsbook has more than 5,000 live sports events with various markets to place your bets on, and it also offers the best promotions and bonuses. The site also helps punters with features like statistics, scores and even real time, in-play tracking of games in Football, Tennis and Basketball fixtures. Furthermore, watching games is now possible with the “Live Streams” feature, which shows a live feed of matches, including the big fixtures in Serie A, Bundesliga, NBA, and more! An added feature is the “Cash Out” button, which allows punters to take their current winnings even before a match has ended. Dafa Sports, with its aim of pleasing the modern Asian punter, has dedicated a whole page for ESPORTS, where markets of live and future games are just within a few clicks from the customers’ fingertips. As a product of Asia’s premier betting site, Dafa Sports is made with a user-friendly design, easily accessible through a wide array of browsers and devices. It also has customer support accessible seven days a week! Aside from accessibility, Dafa Sports strictly abides by the “know you customer” and anti-money laundering policies, so it ensures that any kind of transactions from payment to withdrawal are easy and secured.